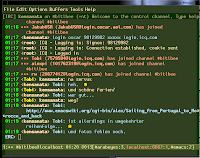 BitlBee allows you connect to other IM networks over IRC clients. It's a great solution for people who have an IRC client running all the time and don't want to run an additional IM Client. BitlBee currently supports the following IM networks/protocols: Google Talk, Windows Live Messenger, Yahoo Messenger, AIM and ICQ.